At 109 square miles, Queens is the biggest borough in New York City. It's also the borough I've spent the least amount of time in. I can't say why that is, exactly, because it's only a hop, skip, and jump by train, ferry, or taxi across the East River from midtown Manhattan. A surge in real estate development and hotel development has travel agents and real estate agents positioning it as a prime location for tourists and homeowners alike. If there is one thing this neighborhood has going for it, it's location. A couple weeks ago, Jeff of Brooklyn Unplugged Tours gave #BlogSquadNYC (Katie of Stories My Suitcase Could Tell, Erin of 10 Miles Behind Me, and Karissa of Which Way to Somewhere) a walking tour of Long Island City. We started at the northern edge of Long Island City at Triple Shot World Atlas, near Queensboro Plaza. The croissant and cold brew coffee gave me more than enough energy to make it through the next two hours and approximately 4 miles of walking. Seven subway trains connect in Queensboro Plaza, which is one of the many reasons why this area is a very convenient (and very noisy) neighborhood to live in. It was interesting to learn of the area's industrial past and the commercial/residential renaissance it is currently going through. Starting the tour at the northernmost extent of Long Island City not only made sense logistically, it also helped Jeff tell the story of the neighborhood. His street art expertise shined through when we got to the Top to Bottom building. There aren't many buildings in New York City which allow artists from all over the world to paint the structure from top to bottom. As we approached Silvercup Studios, the largest film studio in NYC, we were hoping to spot a celebrity entering or existing. Hit series like 30 Rock and Mad Men (among so many others) have been filmed here. We turned south and made our way down Jackson Blvd where the juxtaposition between old and new was most apparent. It's not just people, but businesses, who are moving into the neighborhood. Both JetBlue and FreshDirect have headquarters in Long Island City. It started to feel much more like a neighborhood once we got to the streets lined with brownstones from the 19th and 20th centuries around Court Square. We finished the tour down at Hunter's Point, a redeveloped industrial shipping yard. The iconic Pepsi-Cola sign was hung in 1936 and is now protected as a New York City landmark. 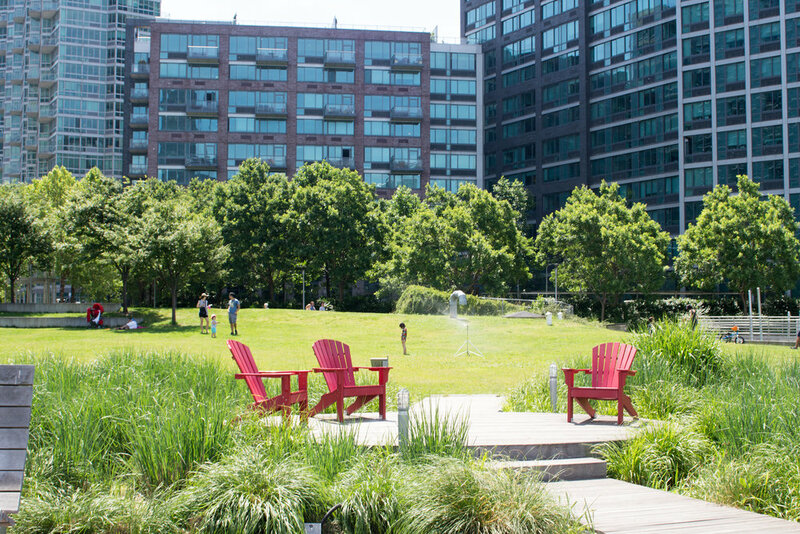 It towers above a well-manicured park and boardwalk along the East River. The whole area has a very relaxing atmosphere. It was a hot day, and I think we were all relieved to finish the tour with such a beautiful view (and nice breeze) at the waterfront. Overall, I enjoyed learning a bit more about the borough. After the tour, we opted to return to the LIC Flea & Food for a bite to eat. The next time I'm in Queens, I definitely want to visit Rockaway Brewing Company, Socrates Sculpture Park, and the shops/restaurants on Vernon Boulevard. For out of town visitors, not only do I recommend taking one of Jeff's tours (try the graffiti and street art tour - it is definitely his forte! ), I also recommend checking out the hotels in this area of Queens. Read about the other New York City tours I've taken, including Williamsburg, Broadway and the Lower East Side. Many thanks to Brooklyn Unplugged Tours for extending the invitation to #BlogSquadNYC for the free tour! All thoughts and opinions are my own.